For web security training, we partner with Pragmatic Web Security. 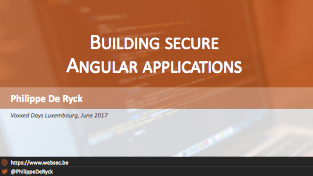 The slides from my Voxxed Days Luxembourg talk about building secure Angular applications. It covers Angular's built-in XSS protection, and points out how you can use Subresource Integrity, Content Security Policy and Sandboxing to further improve the security of your application.